Forest edges and openings; interiors or forests with thin to moderate canopies; thickets; old fields; and roadsides. Full to partial sun. 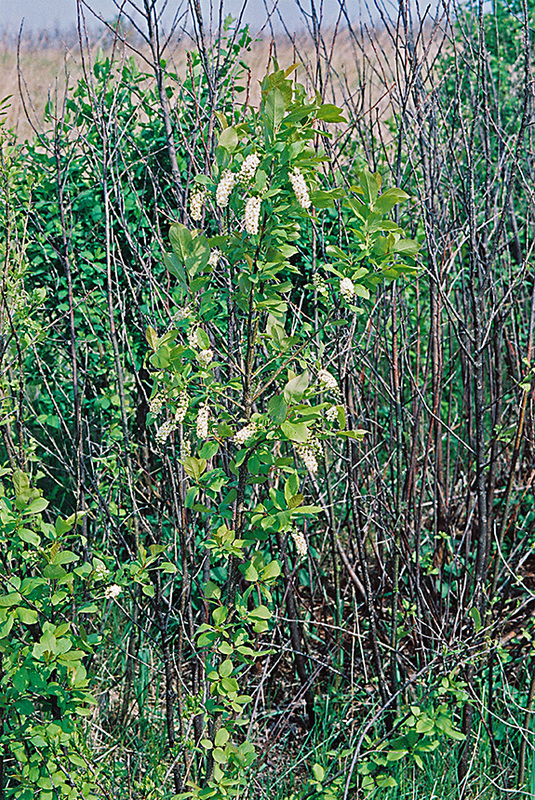 This is a deciduous, relatively slow-growing, short lived, 8′ to 25′ tall, up to 6″ in diameter woody plant that rises from a network of shallow, ⅜″ to ½″ in diameter rhizomes. 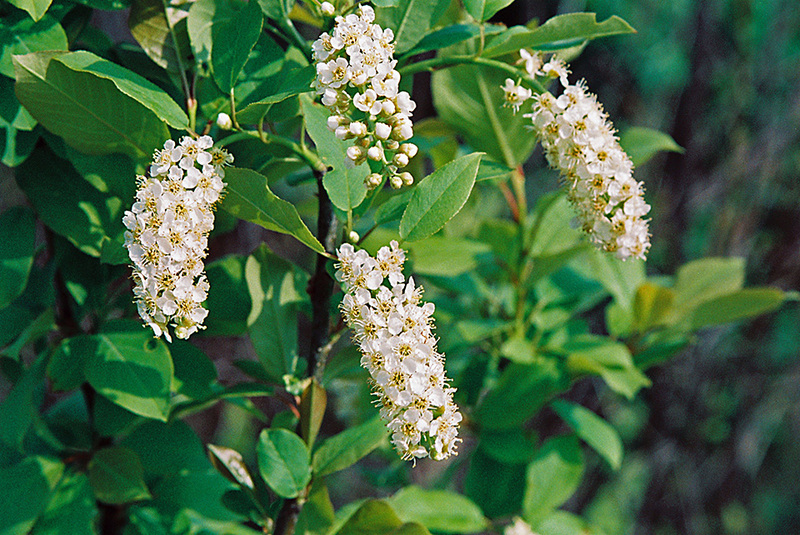 It is usually a tall shrub with multiple stems, though on favorable sites it may be a small tree with a single trunk. It is short-lived and relatively slow growing. Roots occur at intervals along the rhizomes and may extend vertically 6′ or more. The root system extends horizontally 35′ or more. The plant often forms colonies (thickets) by producing aerial stems from buds on the spreading roots (suckering). 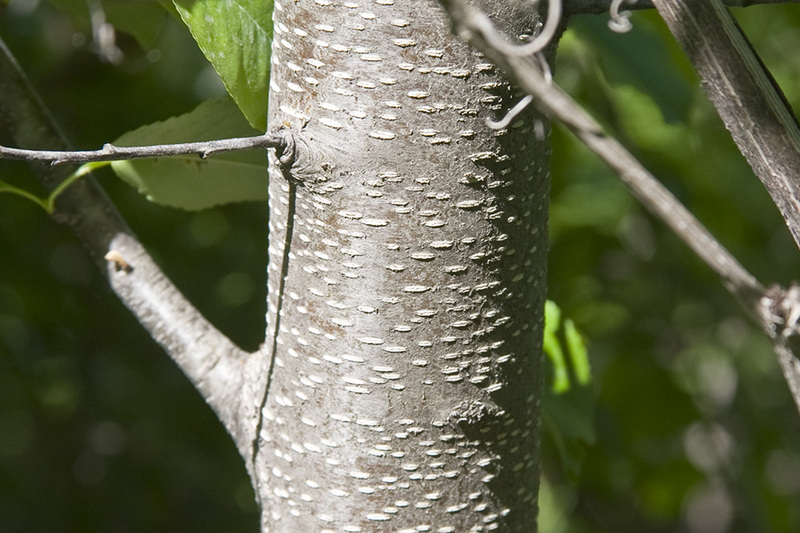 The bark on young stems is smooth and dark grayish-brown. It is covered with numerous, pale, horizontal lines (lenticels). As it ages it becomes darker and rough; the outer layers develop tight, curled peeling edges; and the lenticels become shallow fissures. Twigs are slender to moderately stout, hairless, and brown to grayish-brown or reddish-brown, soon becoming dark reddish-brown. They do not have an outer grayish skin that wears off. When scratched the twigs have a bitter almond odor and taste. Buds are reddish-brown, sharply pointed, and small, only about ⅛″ long. They are held slightly away from the twig. They are covered with about 10 scales. The scales are pointed, dark brown at the base, and gray at the margins. 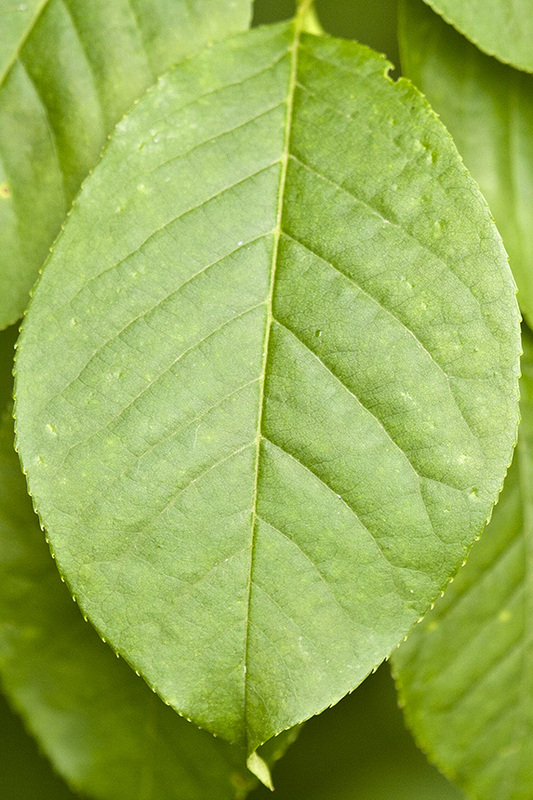 The leaf scars are small, raised, and semi-circular. They have 3 bundle scars. The pith is solid. 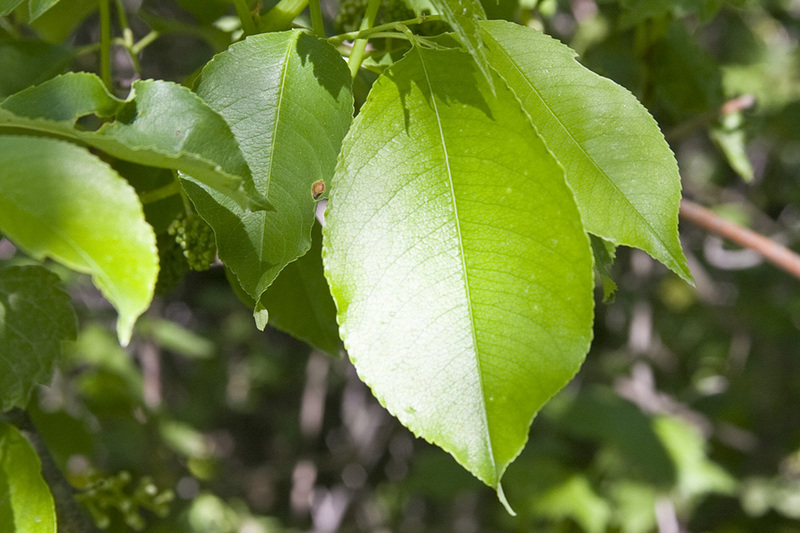 The leaves are alternate, broadly elliptic or inversely egg-shaped, 2¼″ to 4″long, and 1¼″ to 2⅜″ wide. They are 1.4 to 2 times as long as wide. They are attached to the twig on ⅜″ to ¾″ long leaf stalks (petioles). The petiole is usually hairless and has 1 or a few stalkless glands near the point where the blade attaches to the stalk. The blade is rounded at the base and tapers to a short point at the tip with concave sides along the tip. The upper surface is dark green and hairless. The lower surface is pale green with whitish or yellowish hairs mostly on the axils of the lateral veins. The margins are finely, singly toothed. The teeth are short and straight. They are not tipped with a minute, hard, gland-like thickening. The leaves turn yellow in autumn. 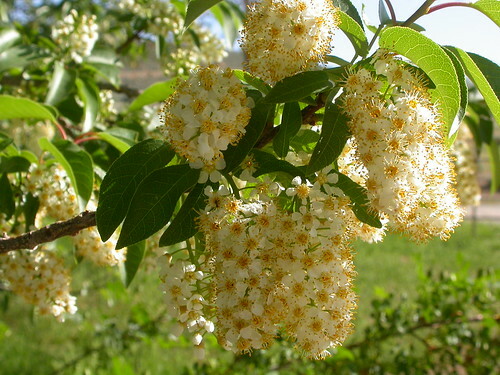 The inflorescence is a dense, elongated, unbranched cluster (raceme) of 20 to 50 flowers at the end of short, leafy shoots of the current season. The racemes are cylinder shaped, 2″ to 4″ long, and about ¾″wide. Each flower is on a hairless, ⅛″ to 5 ⁄16″ long stalk. 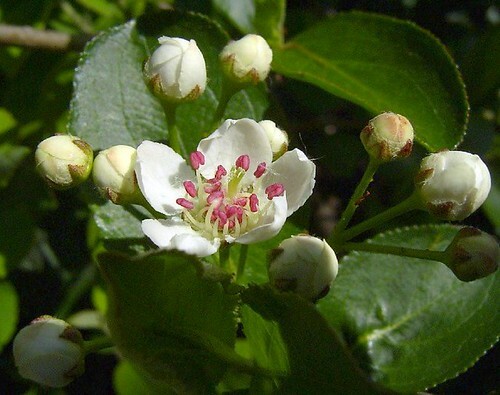 The flowers are ⅜″ to ½″ in diameter. They open in early May to mid-June before the leaves reach full size. There are 5 sepals, 5 petals, about stamens, and 1 style. 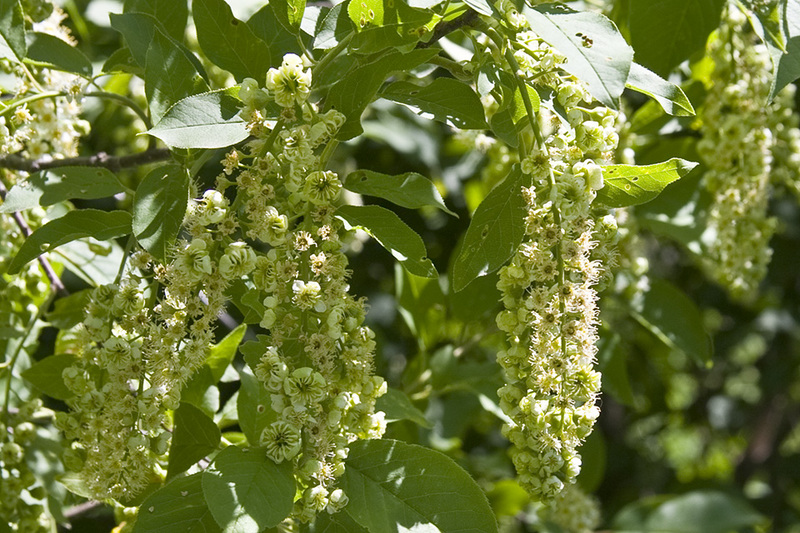 The sepals are green and 1 ⁄64″ to 1 ⁄16″ long. They have 10 or more minute, red glands or glandular teeth on the margin. The petals are white, ⅛″ to 3⁄16″ long, and conspicuously narrowed at the base (clawed). The claw is about 1 ⁄32″ long. The expanded portion of the petal is circular, cupped, and about ⅛″ wide. The stamens have ⅛″ long, translucent green filaments and yellow anthers. The fruit is a fleshy, one-seeded, spherical or inversely egg-shaped, 5 ⁄16″to 7 ⁄16″ in diameter drupe. 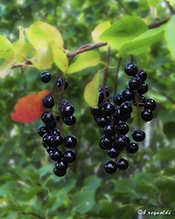 It is green at first, red later in the season, and finally dark reddish-purple to blackish when it matures in mid-July to late August. The sepals do not persist in fruit. 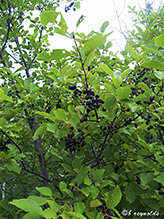 The ripe fruit is very astringent but edible when ripe. 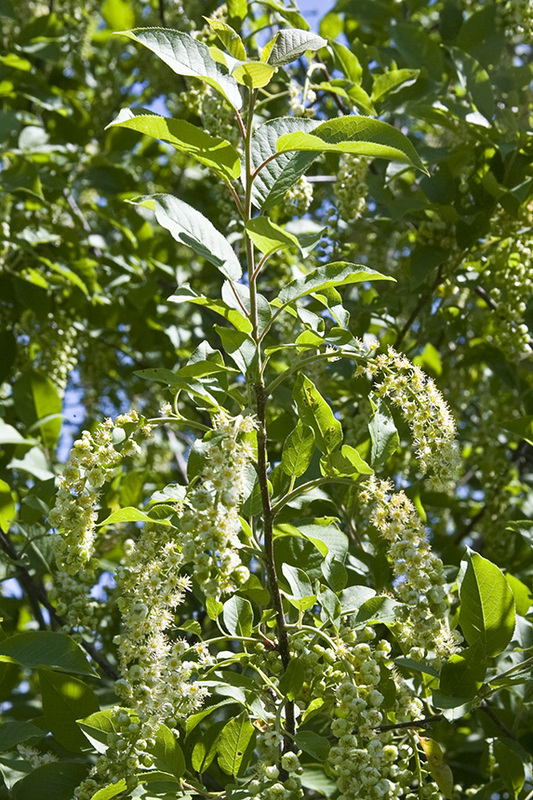 Black cherry (Prunus serotina var. serotina) is a tree with a single trunk. The bud scales are green at the base and reddish-brown at the tip. 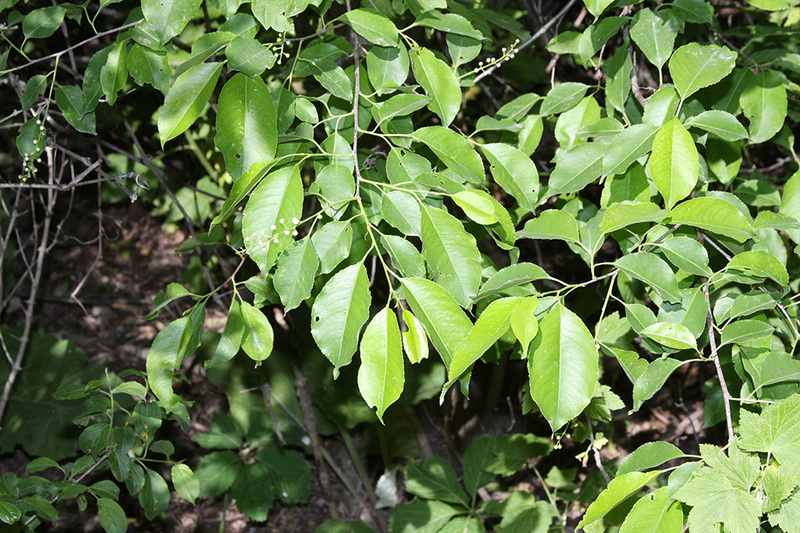 The leaves are narrower, 2 to 3 times as long as wide. The lower leaf surface is hairless except for a narrow patch of rust-colored hairs along both sides of the midvein on the lower ½ or ⅓ of the blade. The teeth on the margins are curved inward. They have a gland-like thickening at the tip. The sepals persist in fruit. A stalk-like narrowed base of some petals and sepals. A fleshy fruit with a single hard, stone-like core, like a cherry or peach. On plants: The thread-like stalk of a stamen which supports the anther. On Lepidoptera: One of a pair of long, thin, fleshy extensions extending from the thorax, and sometimes also from the abdomen, of a caterpillar. 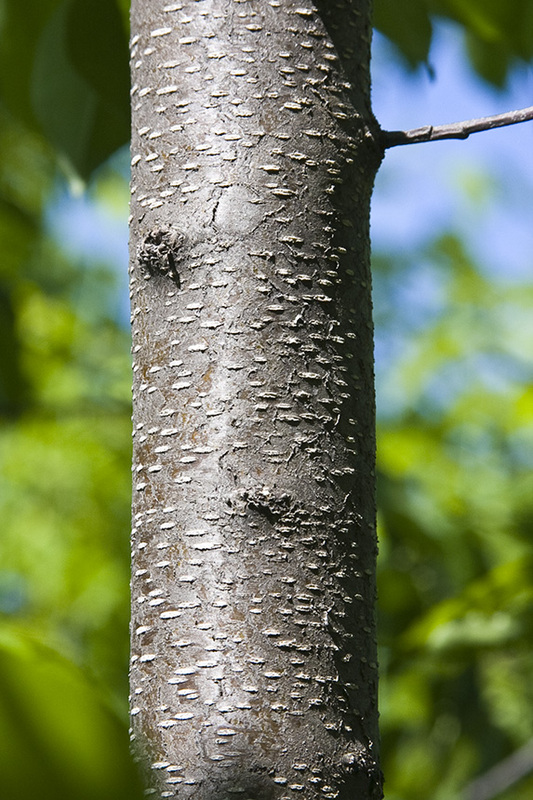 A corky, round or stripe-like, usually raised, pore-like opening in bark that allows for gas exchange. The stalk of a leaf blade or compound leaf that attaches the leaf blade to the stem. The spongy cells in the center of the stem. An outer floral leaf, usually green but sometimes colored, at the base of a flower. A basal shoot rising from the roots or from a bud at the base of a shrub or tree. Fruit: drupe. 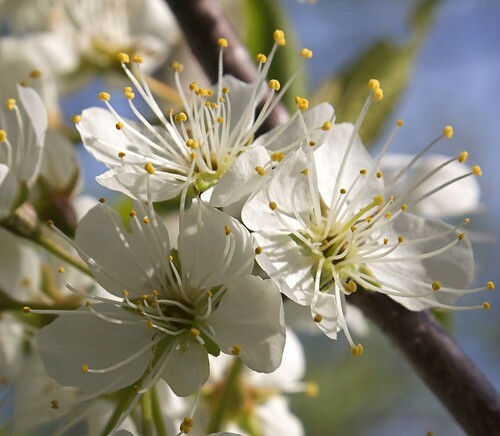 Prunus is the only genus with a single ovary per flower that develops into a drupe. Shrubs to small trees, up to 6m tall, usually riparian and site with high water table, common throughout Montana and sometime entering open understory, sagebrush steppe, and rangeland near riparian areas. 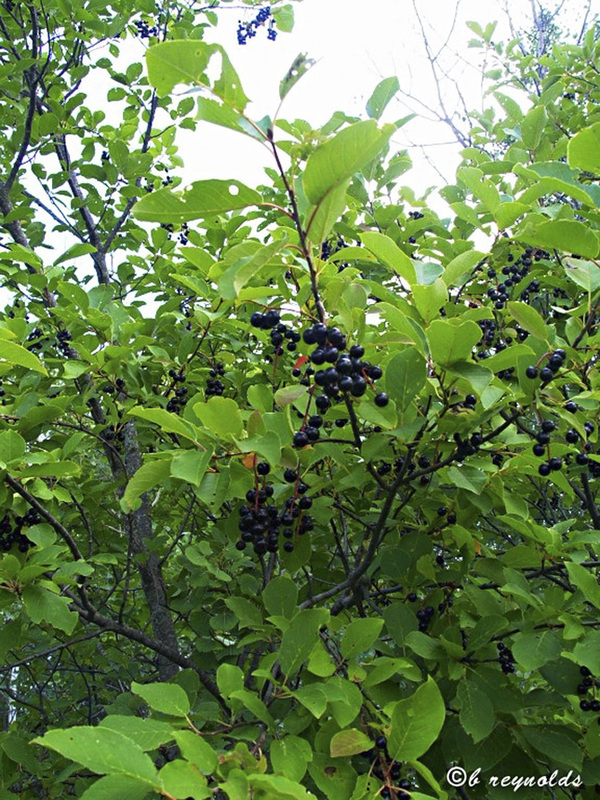 Wild edibles, ChokeCherry tree Identification. 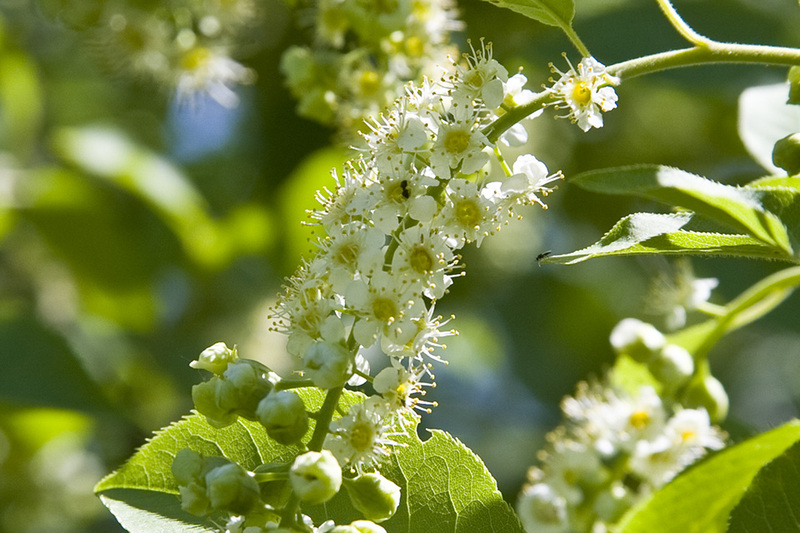 The Chokecherry tree can be a big tree, the berries while tart and mouth numbing, they ere edible, a bit sour, but they make great jellies and jams. Here is a springtime view of the tree as a cross reference for anyone interested. Thank You. 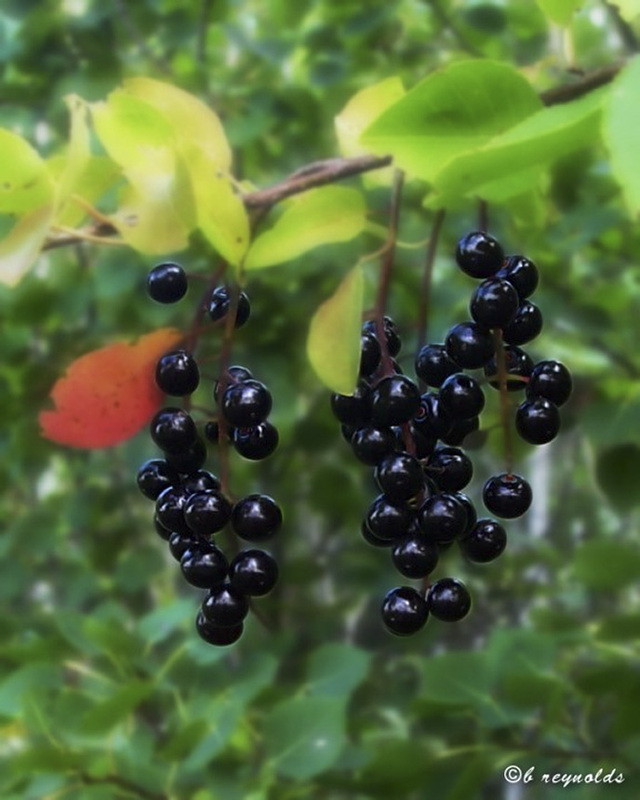 chokecherries ripe all over the park- alongside lakes and on trails as well.